Steve Jobs understood the advantages of the iPhone before consumers ever dreamed of such a device. 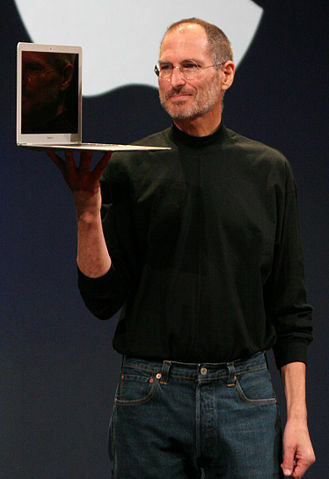 The products provided by entrepreneurs such as Steve Jobs change society and push it forward in unplanned ways. Before the entrepreneur can succeed, the public must see the benefit of the innovation, whether it is a new gadget, new material, or new system of using information. When customers believe that owning the new product, whatever it may be, improves their lives, then an entrepreneur has the chance of selling that item to the customers. If customers decide that a product isn’t what they need or may even have a negative impact on their lives, they may refuse to purchase and the entrepreneur either learns to change the product or goes out of business. This process, taking place in a free and open society, means that entrepreneurs must continually develop ideas which improve the lives of customers. Another goal for entrepreneurs is to have customers who repeatedly purchase goods or services. To do that, entrepreneurs must continually produce and improve a quality product, or customers will try to go elsewhere with their business. At the same time, in order to put such effort into their work, entrepreneurs must be assured of being able to keep a significant percentage of their profits. They must know that their property, whether it is a factory, a copyright, or a bank account, is safe and able to be used in the future. We often use the term “property rights” when discussing protection of property owned by individuals. Entrepreneurs need to know that patents (the exclusive right granted by a government to an inventor to manufacture, use, or sell an invention for a certain number of years) protect their intellectual property. Thus, property rights and a sound monetary system are of vital importance. What are the negatives of this free market system? Society changes as new products surge into the marketplace, and that change may mean that old products lose their value. Workers may have to change jobs or get new training and skills to find employment. For example, when Americans began buying Henry Ford’s Model-T car, the makers of carriages and buggy whips had to find new jobs. More recently, as most Americans purchased a cell phone, the number of homes that still had a “landline” from a traditional phone company declined. Consequently, many phone companies have adjusted and now offer high speed internet, home security systems, and cable television. This disruption of old services as new ones emerge isn’t just a modern phenomenon. In the early 1800s, as steam-driven textile machines became popular, those English workers who had used old-fashioned spinning frames and weaving looms rebelled. The new textile machines produced cloth in a fraction of the time required on the old looms, and the new machines could operate with one human operator keeping an eye on multiple processes. The result was that the price of cloth fell dramatically, but the change also put many textile workers out of business. The textile workers didn’t rush to train for other work. Generations of their families had woven cloth on wooden looms: the new machines, part of industrialization, seemed to be an evil threat to their entire way of life. They formed groups called “Luddites,” probably named for Ned Ludd, a youth who had smashed machinery when the industrial revolution began. The Luddites met at night on the English moors and planned their strategy. Workers began smashing new machinery in factories and even burned textile mills to the ground. For a time more British soldiers were in England stopping the Luddites than fighting Napoleon’s troops in Europe. Generations of their families had woven cloth on wooden looms: the new machines, part of industrialization, seemed to be an evil threat to their entire way of life. After six or seven years of conflict, the Luddite movement died out. Workers accepted that the new textile machinery had more positives than negatives. But workers had to re-train and often moved to new areas to find work. Such displacement also led to the large waves of immigration to the United States in the nineteenth century. Cities grew as workers, whether recent immigrants or rural Americans leaving the family farm, flooded into urban areas to work in industry. Unlike the Luddites, most citizens of the early 1800s welcomed the conveniences and the lower prices due to the new steam powered devices. For example, on the Mississippi River, before the invention of the steamship, travel upstream was almost impossible. Getting any manufactured goods to towns north of New Orleans meant transportation costs were so high that most settlers couldn’t afford luxuries such as factory-made furniture. Even food and hunting supplies, such as lead for bullets, had to be sent north on slow-moving wagons or rafts on the river that were pulled upstream by teams of mules on the riverbanks. But when steamboats began plying the Mississippi, everything changed. Suddenly Americans had a means of traveling upstream that didn’t depend on wind or muscle for power. Steamboats could sail up and down the Mississippi River, delivering goods and providing a convenient means of travel for passengers. Prices of goods at stores along the river fell to one-sixth of their former prices. Settlers could then afford food, clothing, and supplies that had seemed impossible to purchase just months before. Factories in the northeast United States could ship goods around the Gulf Coast to New Orleans, and then upriver to these new customers, opening up entire new markets. Steamboats could sail up and down the Mississippi River, delivering goods and providing a convenient means of travel for passengers. History is full of examples of other inventions that have benefited society. Air conditioning was first invented to lower the humidity in print shops so that ink would dry more quickly. When Willis Carrier realized that his “air conditioner” also lowered the temperature of the air, he marketed his invention to movie theaters in the 1920s to use during the hot summer months. Attendance at movie theaters in July and August skyrocketed. Entrepreneurs succeed when they provide a product that benefits their fellow citizens. Any society needs entrepreneurs to spur development of new concepts, and a wise society will promote those policies that keep entrepreneurs in the marketplace.